Race week is upon us and we're looking forward to seeing all Terra runners this Saturday on the trails of Linne Woods! Participant check in, and packet pick up will take place from 7:00 am to 8:45 am at our race start/finish location at Grove #2 (see map below). Parking is nearby, within steps of our start/finish pavilion. Please watch for our "race alert email," which will blast to all participants at 8:00 pm later today, and will include race-day details, rules of competition, and updated trail conditions. Returning for 2017... our Terathlon 8-Hour option for ultra-trail runners with a 7:30 am starting time. 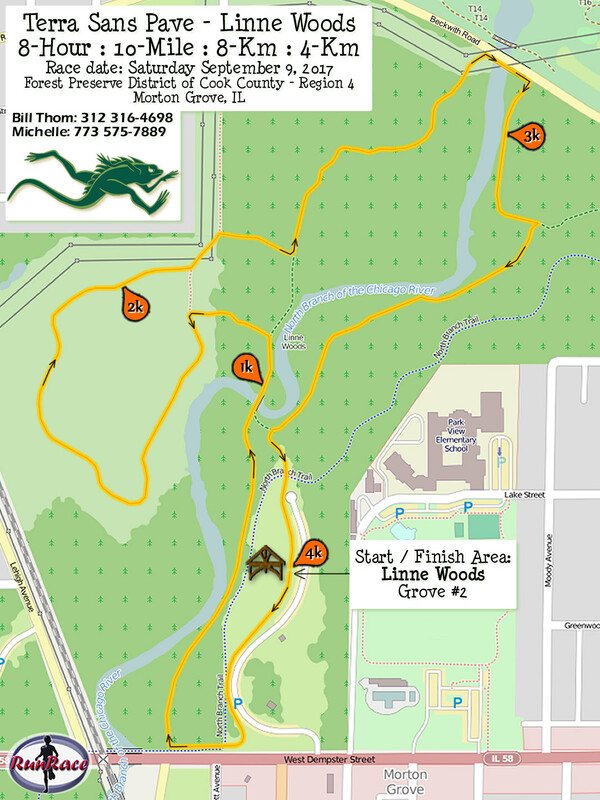 Our 2017 Terra Sans Pave - Linne Woods trail runs takes place entirely within Region 4: North Cook County, nearby the North Branch Trail system of the Forest Preserve District of Cook County, in Morton Grove. Linne Woods, Grove #2 pavilion serves as race start / finish area and our aid station.